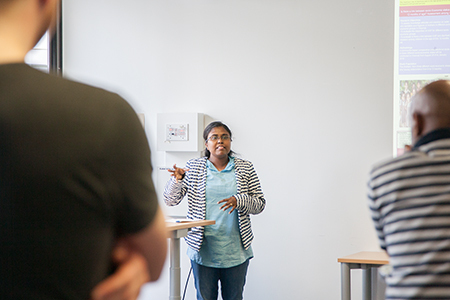 Projects, which shall become PhD projects: That was the topic for the event on 30 May, Meet the Start-ups. 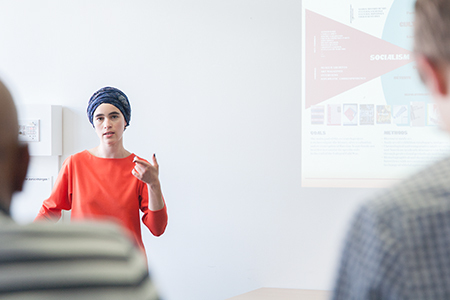 The six Start-up Scholars working at the BGHS on their ideas to develop them into exposés, presented their research fields in frame of a short poster presentation. The sociologist Yordanos Estifanos made the start. 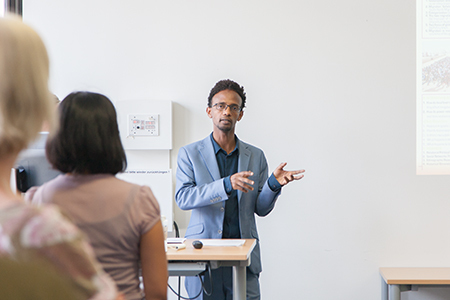 He deals with migration movements from Ethopia to Europe and how these are influenced by local socioeconomic developments, but also global factors like border regimes. Furthermore he wants to find out how the networks work which are behind the migration movements. 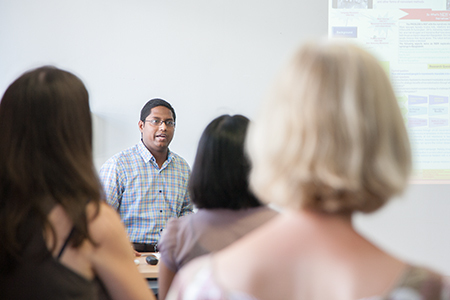 Moynul Haque, sociologist as well, is interested in the civil rights movements in Bangladesh. He wants to find out how the movements mobilize the supporter for their goals, and how they develop into non-violent resistances with support of the whole society. Sundara Hannah Shirley Jeyakumar Christdoss’s concern is infant morbidity in India, especially in the region of Chennai. She wants to examine the connection between the socioeconomic status mothers with the danger for their children to suffer of a diarrheal disease. The infant morbidity rate in Chennai is mainly driven by diarrheal diseases. 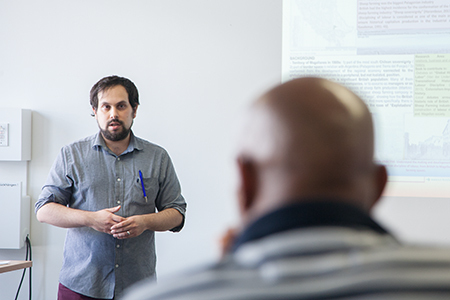 Nicolás Gómez Baeza is a historian. He is interested in how the sheep farming industry in Chile had worked from the end of the 19th century until the middle of the 20th century. His main question is, how British farmers developed repertoires of labour discipline. 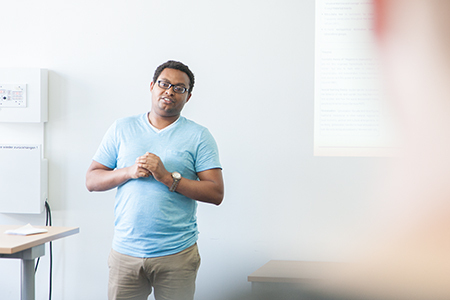 Mezgebu Mengistie examines, how the ideal of masculinity is connected with retaliation – focused on the people in Raya Kobo, an area in the Ethiopian region Amhara. He wants to know why the ideal of masculinity leads into violence, and if the ideal is changing recently. Olga Olkheft has the view of an art historian on the Cold War. She asks the question which role Russian modern art played through the Cold War, if the art was used as a weapon or if the Cold War was used as context for representatives of the art. 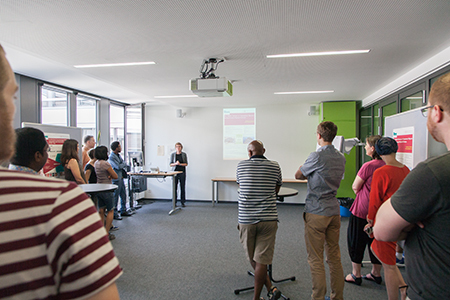 The poster presentation session was followed by an informal get-together with the doctoral researchers of the BGHS. 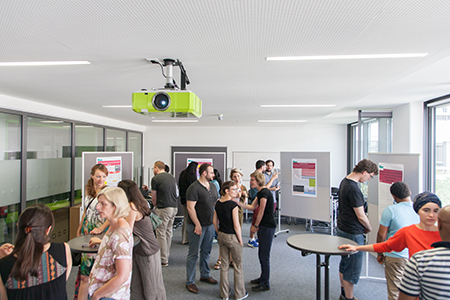 All participants had the chance to walk around in the poster exhibition, ask further questions, discuss the planned projects and get in contact.